My mother had me when she was 15. A child having a child. And we were Poor. I grew up in a shack with no bathroom, a wood burning fire. No neighbours for 20 miles. Crescent City was on the border of California and Oregan and we lived off the land (and there wasn't a lot to live on). I never knew my father. His name was on my birth certificate, and that was pretty much all I knew about him. My mother said he was a hard-working man, which is a contradiction for me. He abandoned his wife and child. What good man does that? She was forced into marrying him by her mother. When I was nine, I started to really see what was happening around me. Alcoholism and abuse was the norm. Every adult I knew growing up was alcoholic. I saw the behaviour of adult men with my mother and it left me feeling indifferent to men in the world, and I certainly had no idea how to actually be one. I was genuinely worried I would become someone like that. I was raised by women and that suited me just fine. Being Indian was seen as 'bad'.. after all, European history depicted us as savages. Even my birth certificate said I was 'white'.. 'Native American' didn't even exist in the world of bureaucracy and official documents when I was born. Lets hope the apocalypse doesn't roll around and I have to explain myself in some strange line-up. My rescue came in the form of an invitation to come to Pow Wow. It is exactly how you'd imagine: traditional headdress and regalia, dancing around a fire, drums and chanting. I couldn't afford acting classes and didn't really know what acting was about until I got my first job. Even with modeling work, I was still essentially a poor kid with no prior connection to this world. Acting comes with rejection, I already knew plenty about that. But I didn't know anything about the business. Why was I hurting myself? Why was I hating myself? Then it dawned on me: I was the 'token Indian'. The cardboard cutout of myself. I realised I had no real respect as a credible actor. I was the right skin colour and race, and that was it. I needed to be saved from myself. My ego had separated me from my actual self-worth. I was beyond lost and had no idea who I was. I had been playing a stereotypical Native American Indian for 15 years without knowing what it actually meant. My first Pow Wow felt like coming home. Overwhelming security, and identification. There was nothing token about me any more. This is who I am -- a Native American Indian man. I've gone from being a kid who was kept away from his heritage (to be fair, my grandparents thought it was the right thing to do), to, just last year, NASA presented Saginaw and I with an award, recognising our contribution to Native American Culture for our work. When I play a Native American in a film now, I know what that means. We travel the world talking about our experience and connecting with Indigenous cultures. It is the greatest honour I can imagine. Our meetings with Indigenous Elders and community members in Australia have been extraordinary. Our experiences are almost identical. 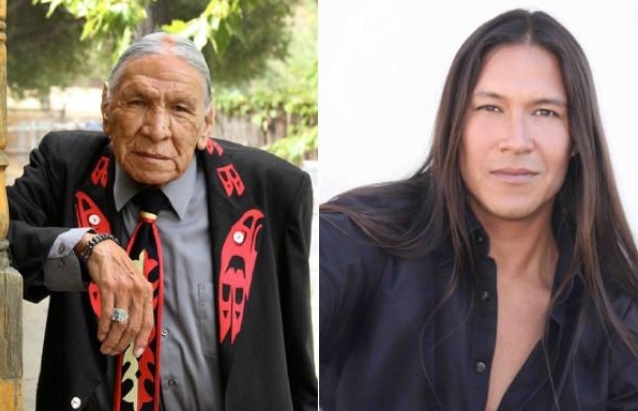 Responses to "Native Actor Rick Mora Explains How Reconnecting to His Roots Saved Him "